“Just when I thought I was out, they pull me back in!” – Silvio Dante, impersonating Michael Corleone, impersonating George Costanza, talking about Disney’s Hollywood Studios, probably. In a Parks Blog post on Tuesday, Disney confirmed the new FastPass+ tiers coming to Hollywood Studios after Toy Story Land opens on June 30th. Over the last year or two, the website was asked a number of times how it expected Studios FastPass+ to shape up in a post-Toy-Story-Land world. My answer has always been the same: Disney is made up of the same assortment of madlads that put Living with the Land in Tier 1. It’s anybody’s guess what they do. And alas, the website’s best guess would have been wrong – I didn’t foresee Rock ‘n’ Roller Coaster moving to Tier 2. Or if I did, a Kylo Ren cupcake was sliced in half shortly thereafter. From Tier 1, the clear favorite is Slinky Dog Dash – all of the marketing is based around it and as a super-cute-looking ride, just about everyone is going to want to experience it. Even if the ride time comes in under a minute, long waits and little FastPass+ availability are going to be the norm. The second choice is a little harder to gauge. But considering Toy Story Mania wait times dropped so much after the third track installation, it wouldn’t surprise me if the low capacity and newness of Alien Swirling Saucers causes it to be a higher priority. Toy Story Mania’s overall average wait for the three months is “just” 53 minutes. It doesn’t seem unreasonable that a newer, slower-loading ride would see an average wait that exceeds that and perhaps comes in closer to 70 minutes. But it’s also possible that the family favorite 4D shooter without a height requirement will surpass the Mater’s Junkyard Jamboree clone. But at least for July and August, I’d expect to see higher demand for Alien Swirling Saucers than Toy Story Mania, but it should be close no matter how things stack up. Rock ‘n’ Roller Coaster’s average wait of 67 minutes is 26.4% higher than Toy Story Mania’s, which is largely why I was surprised that it would drop down to Tier 2. You’d think that some number of thrill seekers would continue making Aerosmith their Tier 1 selection over Slinky Dog, which would in turn increase FastPass+ availability for those that are really looking forward to experiencing the Toy Story Land coaster. Tower of Terror’s overall wait of 42 minutes is 25 minutes shorter than Rock ‘n’ Roller Coaster’s and 11 minutes shorter than Toy Story Mania’s. Still, that’s “just” 20.7% lower than Pixar Place’s (former) headliner. FastPass+ will continue to save a lot of time here. Star Tours’ 31-minute overall average is nothing to scoff at, particularly with its 45-minute average wait around noon when it makes the most sense to use FastPass+. The Frozen Sing-Along remains the most popular show at the Studios and is the least likely to have FastPass+ availability for afternoon showtimes. The next four shows descend in order based largely on that qualification. Fantasmic dropping all the way down to the second-to-last spot may or may not be surprising, but with more than 3,000 experiences distributed for each nighttime performance, cancellations are incredibly common and it’s relatively easy to book the nighttime spectacular into the early evening, long after the other shows have ended for the day. If you don’t believe me, fire up the app and check on tonight’s FP+ availability around 6pm. Refresh a few times and you should see Fantasmic come up along with Muppet Vision and Little Mermaid. Muppet Vision doesn’t fall to last place on quality, of course, but it’s virtually always the Studios’ last attraction to see FastPass+ availability. When available, most people are going to want to select Slinky Dog Dash along with Rock ‘n’ Roller Coaster and Tower of Terror. If any of those are unavailable or you’d prefer to do something else, move your way down the list until you see an attractive option. The Studios will see long operating hours this summer as well, operating from 8am to 10:30pm daily from July 1st through August 25th with a morning Extra Magic Hour every day. Evening Extra Magic Hours will also return to the Park on Friday evenings, running from 10:30pm through 12:30am. Here’s a look at wait times from April 17th, the second day that Toy Story Mania operated with just one of its three tracks and didn’t offer FastPass+. I discussed what that meant, along with some tips on how to experience the ride with a short wait, in depth in this post, but the trends look to be similar. Crowds are relatively low at the moment, which helps too. Here’s yesterday, April 18th, which may end up being some of the lowest waits of the entire year, particularly given the sunshine. Rock ‘n’ Roller Coaster goes down around 10am, but it’s a virtual walk-on until then. Waits elsewhere are short for most of the day, though downtime at Tower of Terror briefly pushes up the wait time there in the morning. Toy Story waits remain very long over the first 90 minutes of operation, but those able to arrive early and move quickly to the attraction will still experience short waits. If you’re unable to do that, get in line around 12pm or wait until last thing at night. It looks like the posted wait is dropping to 20 or less minutes after 8:30pm. With that out of the way, we move on to what else is going on around the Park. Here out in front of the entrance, there’s actually someone doing some work on what will be the Park’s gondola station as the sun rises in the early morning. Here’s a look at the gondola towers as they traverse the parking lot. It’s going to be pretty crazy seeing the gondolas glide through the sky so close to the ground across property. And arriving just a handful of feet away from the bus stop over to Port Orleans. It might even be crazier to imagine people actually wanting to stay at Caribbean Beach, but it’s probably not a coincidence that the gondola installation is arriving at the largest of the Moderate resorts. Of course, there’s the DVC addition too. As usual, little construction is visible from inside the Park as we look towards the future entrance to Toy Story Land. 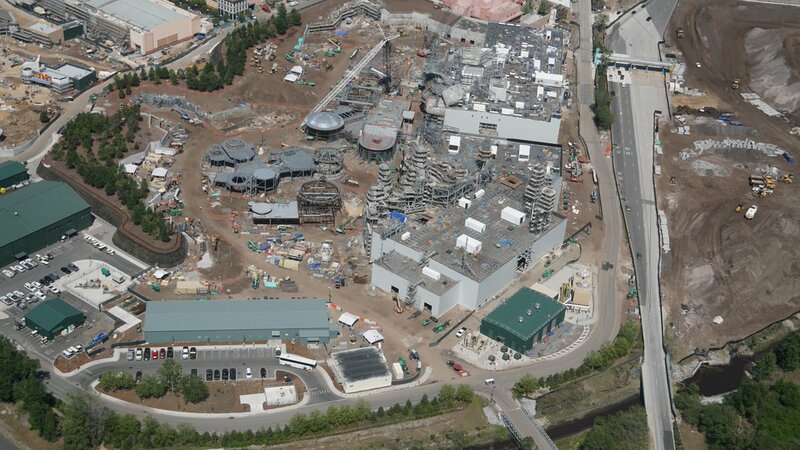 Here is what the project looks like from the sky. Some sort of structure is being built here – perhaps it’s a claw that will pick people up and place them inside Star Wars Land. People are going to get too used to air travel from all of the gondola rides. Galaxy’s Edge continues to grow taller as seen here from Grand Avenue. Here is what it looks like from the air with another angle here. Enjoy getting this close while you still can. Grand Avenue remains the home of Goofy, typically meeting to the right of Tatooine Traders and closer to BaseLine Tap House. Chip and Dale meet much closer to what will be the Galaxy’s Edge entrance. Speaking of BaseLine, it remains one of my favorite places to grab a drink on property. I have a review of the updated menu in this post. The Miss Piggy fountain is back. But she does not yet spin. Work probably continues on the Railway ride inside the Chinese Theater. Apparently there was some issue with bugs taking up residence inside of the facade over the weekend. It wouldn’t surprise me if Disney counts them as paying guests in hopes of boosting second quarter attendance numbers. Sweet Spells closed on the 16th to make way for what is expected to be an expanded store full of Toy Story merchandise. They should make the last one only with “Bloggers” and scarier monsters. Over at the Tower of Terror exit/the back of the gift shop, you can get the same Lenticular Morphing Photo that’s available at Memento Mori at Magic Kingdom. It’s a steal at 20 bucks and the old-timey feel of the process is fun. Take a rare opportunity to see the Walt Disney: One Man’s Dream film in what is now Walt Disney Presents. An Incredibles 2 Teaser debuts May 18th. I’m surprised that we’re not seeing a Solo: A Star Wars Story preview. There is a limited amount of merchandise available for the movie that comes out May 25th. You’re largely spared from inconsequential menu updates, but ABC Commissary’s electronic menus have arrived. There seems to be a shakeup of beer options upon us with Corona Extra available on draft at this cart. For years, Safari Amber was exclusive to the Animal Kingdom area along with Refreshment Cool Post at Epcot, but is now available at a variety of carts in Hollywood Studios. Schofferhofer, the popular grapefruit water from the Germany Pavilion, is available at another. Goose Island 312 was also available, among others. Dockside Diner on the water at Echo Lake is serving a S’mores Brownie. Along with this menu, which includes the Schofferhofer in what may be a can. A reminder that PizzeRizzo is back to closing at 4pm after briefly serving until 7:30pm around Easter. On the side of the building behind the Sci-Fi car photo-op. The car for which is currently out for refurbishment. I returned to Backlot Express. Because the bun on the Royal Guard Burger is no longer black. But it’s otherwise the same. The option to add bacon doesn’t appear elsewhere and it probably would not have occurred to me to ask. But it’s an option down at the bottom. I don’t think I’d seek this out specifically, but the refillable fountain sodas are nice and the menu offers a little bit of variety along with Disney’s standard options. It’s still weird to see Safari Amber on the permanent menu. Maybe somebody accidentally wrote 10,000 kegs on the order form instead of 100. Plenty of patriotic duds available to wear under the bags of ice taped to your body this July 4th. I’m going to fit in so well that I’m not even expecting to get any second looks. That’s what’s going on at the Studios. I think we can put it to rest for at least a week. I don’t suppose you want to do a RD for Jedi Training Academy sign ups-to-Toy Story Mania without FP+ availability to see what kind of wait times those of us trying to do both will be looking at for the next two months, huh? I spent last weekend at Carowinds. Fury 325 is an awesome coaster, but I had the worst theme park burger I have ever had—and that is saying something. What do you think those 7 AM EMH starts are going to be like this summer? I am assuming that after the craziness of the first few days, not a lot of visitors are going be getting to the gate before a 7 AM opening. Great update, and I liked seeing the Wall-E merchandise. Not a lot of that going on, and I wish they did more. And a meet and greet!